Who Invented Soccer? Is there a soccer "founding father"? You've probably come here looking for the name of a specific person responsible for creating the sport. Unfortunately, unlike basketball, we simply don't know who invented soccer, likely because there wasn't one individual person responsible for its creation. More likely, soccer is the evolution of thousands of years of sport, and the refining of many different ideas and concepts. Then where did it come from? Did anyone create soccer? Sports resembling soccer can be traced back several thousand years to the 3rd century BC, where there are records showing the Chinese military used a sport resembling soccer as a kind of training tool. 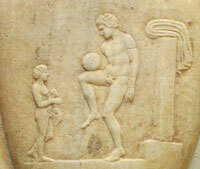 Players were meant to push a leather ball filled with feathers and hair through a small (30-40cm) opening. The Japanese sport known as "Kemari" can trace its origins back 500-600 years. Several individuals would stand in a circle and pass a ball to each other using their feet without letting the ball touch the ground in a type of game many still play to this day amongst friends. When did it actually start to look more like modern soccer? Much later on, the Roman's introduced a game called "Harpastum" that much more closely resembled the modern game. In it, two teams competed against each other on a rectangular field marked by touch and center lines, much like today. In an almost rugby kind of way, the objective of the game saw players try to move the ball past their oppositions boundary line by any means necessary. This often violent sport spread throughout the Roman Empire including Britain, where the modern game was eventually born hundreds of years later. Unfortunately, none of these great civilizations can really be credited with "inventing" the sport since what they were playing really can't be referred to soccer as we know it. But it was all of these ideas they contributed which eventually led to the modern game. Well, yes and no. It depends on what you mean by "invented". As far as the modern game is concerned, the British are widely credited with establishing the rules for soccer when The Football Association was established in 1863 adopting the Cambridge Rules as the basis for the modern game and splitting up rugby and football forever. Regrettably the British chose not to involve themselves when, several years later in Paris, FIFA was formed by a group of Europeans including its first president Robert Guerin. Guerin had a vision of a governing body that existed for the purpose of merging the different rules currently in use and promoting the sport worldwide. But again, he can't be credited with anything more than the vision for unifying the sport and, of course, founding FIFA. Therefore, there really is no straight answer to "Who Invented Soccer?" The modern game really does belong to the individuals who helped found the organizations that unified it, and the early athletes that helped turn the fledgling game into the world's most popular sport. Return to the History of Soccer from Who Invented Soccer?